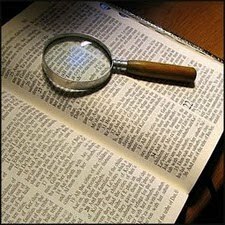 DO YOU KNOW: That "restitution" means restoration, as most other Bible translations show? ● That some think it means only one's returning anything wrongly taken (Ex. 22:1-6, 12; Lev. 6:2-5; Ezek. 33:14-16), but that the Bible shows it means far more—the greatest kind of restoration and the greatest blessings ever—soon to come on earth for all people? DO YOU KNOW: That the Bible states, "In the beginning God created the heaven and the earth" (Gen. 1:1), but not how much time from then until the six great creative days, in which He gradually prepared the earth for human life? ● That God made the plants and animals and then "a garden [paradise] eastward in Eden" (Gen. 2:8), with perfect ecology, where He created Adam, "the first man" (not to become a spirit being, an angel, but forever to be a human being), "of the [dust, or] earth, earthy," "a little lower than the angels" (Gen. 2:7; Psa. 8:4-8; 1 Cor. 15:45-47)? ● That Adam was given rule over the earth and animals (all were then tame), which he named; and that then God created Eve as his wife and helpmate (Gen. 1:26-28; 2:18-25)? ● That they and their descendants could have had perfect life forever on a perfect earth if they had obeyed God, but that when they disobeyed they were sentenced to death, cessation of life (Gen. 2:17), and were driven out of and kept out of the garden of Eden, lest they continue to eat the life-sustaining fruit of the trees and live forever on earth (Gen. 3:22-24)? ● That by heredity the Adamic death sentence came also on all of Adam's descendants, so that none of mankind has a right to perfect life in a perfect earth, but has only an imperfect, dying existence (Rom. 5:12-19; 1 Cor. 15:21, 22)? ● That God showed His great love for all mankind (including you and me) in planning to free all from the death sentence by providing a ransom (corresponding price) for them? DO YOU KNOW: That God's only begotten Son, the mighty Logos, willingly was "made flesh," "the man Christ Jesus," "a little lower than the angels, for the suffering of death … that he by the grace of God should taste death for every man"—Adam and all his lost race—and that Jesus "gave himself a ransom for all, to be testified in due time" (Matt. 18:11; John 1:14; 3:14-18; 1 Tim. 2:3-6; 4:10; Heb. 2:9-14; 1 John 2:2)? ● That because of Jesus' willing Ransom-sacrifice all, living and dead, are guaranteed one opportunity "in due time" to gain eternal life—that the Church, selected during the Church Age, is given eternal life in heaven (2 Cor. 5:1-4; Heb. 10:34), but that all who had no opportunity and afterward repent for sin, believe on Jesus as Savior and give themselves loyally to God will in the Millennium ("times of refreshing") have an opportunity to get restitution (restoration) to perfect human life forever on the perfected earth (Psa. 37:9-11, 22, 29, 34; Matt. 6:10), which life Adam could have had? ● That in the restitution times animals will be tamed, the earth perfected (Isa. 11:6; 35:1, 2) and filled with God's glory (Num. 14:21; Isa. 11:9; 40:5; Hab. 2:14); and the obedient of mankind in general (Rev. 22:17) will be restored to perfection as Adam had it; the wicked will be annihilated; but the righteous will live forever in prosperity, peace, happiness, brotherhood and love in the new earth (Psa. 72:1-20; Isa. 65:17-25; Matt. 6:10; Acts 15:14-18; 2 Pet. 3:13; Rev. 21:3, 4; 22:1-3)? DO YOU KNOW: That "the times of restitution," of which all the holy prophets spoke, the 1000-year rule of Christ (Rev. 5:9, 10; 20:4, 6), follows His Second Advent (Acts 3:21), and that with His Church He will destroy the present evil world conditions, establish His righteous rule on earth and forever bless all obedient humans (Isa. 2:2-4; 11:1-9; 25:6-10; 35:1-10; Dan. 2:31-45; 7:13, 14, 18, 22, 27)? ● That "the signs of the times," such as great evil, exposures, calamities, apostasies, crises, war preparations, conflicts and terrorism, Israel's return, increased knowledge and travel, etc. (Luke 12:2; 21:11, 25-32; Dan. 12:4, 10), prove that we are living in the end of this Age and that Christ will soon begin the restitution? ● That all should rejoice greatly at the wonderful prospects for all on earth and tell others this good news of God's soon-coming Kingdom on earth (Luke 2:10-14; 21:25-28)?